Edward "Ed" J. Landers, 80, of Poquonock, beloved husband of almost 60 years of Judy (Ball) Landers, passed away peacefully on Tuesday, January 24, 2017 at St. Francis Hospital. Born in Springfield, MA to the late Leon and Nora Landers, he was raised in Springfield and has been a Poquonock resident most of his life. Ed served his country proudly with the US Navy during the Korean War onboard the guided missile cruiser Canberra and then the battleship USS New Jersey. 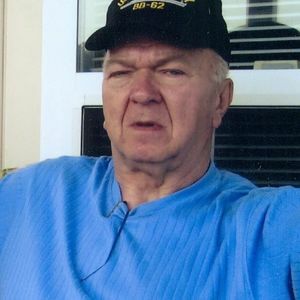 He was a member of St. Joseph Church in Poquonock, the Windsor Elks Lodge #2060 and St. Casimir's Lithuanian Society and in his spare time he enjoyed bowling and golfing. H will be dearly missed by all who knew him. Besides his wife Judy of Poquonock, he is survived by his sister Helen Toth of Niantic; his nephew Stephen Toth of Longmeadow, MA; his niece Jacqueline Footman Garden and her husband Philip of Wallingford. Besides his parents he was predeceased by his sister Shirley Footman. His family will receive friends on Friday, January 27 from 4 PM to 7 PM at the Carmon Poquonock Funeral Home, 1816 Poquonock Ave Poquonock. Family and friends may gather at 9 AM Saturday, January 28 at the funeral home to process to church for a Mass of Christian Burial at 10 AM at St. Joseph Church, 1747 Poquonock Ave, followed by burial with military honors in St. Joseph Cemetery, Poquonock. St. Joseph Church, 1747 Poquonock Ave., Windsor, CT 06095 Funeral Service for Edward J. Landers https://www.tributes.com/obituary/show/Edward-J.-Landers-104395511#services https://www.tributes.com/obituary/get_ics/104395511?service=3419534&tr= Family and friends may gather at the funeral home at 9 AM to process to church. Family and friends may gather at the funeral home at 9 AM to process to church. My deepest condolences to you. The both of you are a true testament of love. Thank you for allowing me to be a part of Ed's care. You both will always hold a special place in my heart! Dear Judy, our deepest sympathy is with you and your family at this sad time. They didn't come any better than Ed. I have great memories of watching the guys play softball and going to "the club" after. He always showed his generosity and respect to everyone and I am a better person for having known Ed over the years. God Bless.